The steps below apply to joining or splitting both personally- and group-owned land. Note: If you wish to make changes to group-owned land, you must be authorized to subdivide and join parcels. Stand on your parcel. Select World > Show > Property Lines (or Ctrl + Alt + Shift + P). Your land boundary appears in red. Right-click the ground and choose Edit Terrain (or press Ctrl-5 on your keyboard). The Build Tools window opens. Use your mouse to left-drag the yellow selection box around the part of your land you want to divide into its own parcel. With the land selected, click Subdivide under Modify Parcel. A prompt asks you to confirm the split. Once you agree, your land is divided into two separate parcels. Both parcels can have their own names, land options, and so forth, and will accrue traffic independently of one another. Are in the same region. You cannot join land across a region boundary. Have the same owner. You cannot join your group land to your personal land. Note: When you join land, the combined parcel takes its name, settings, and database ID from the larger of the two parcels. This may have an impact on search rankings, so proceed with caution. Stand on one of the parcels you wish to join to another. Select World > Show > Property Lines (or Ctrl + Alt + Shift + P). Right-click the ground and choose Edit Terrain or press Ctrl-5 on your keyboard. Use your mouse to left-click and drag the yellow selection box so that it spans the border between the two parcels you want to join. Tip: You must select land from both parcels that are to be joined, but you do not need to select the entirety of both parcels. In the Edit Terrain window, click the Join button under Modify Parcel. Right-click the ground and choose About Land to make sure that your settings are correct. To transfer a mainland parcel from one account you own to another, one account must sell the land to the other account for L$0. Keep in mind that both accounts must be premium accounts, and the account that ends up owning the land needs to have enough available land tier. Important: Be sure that when you set the land for sale, you set it for the specific account you want to end up owning it — otherwise, anybody could theoretically swoop in and take the land you wanted your other account to have. Every parcel of land in Second Life can support a limited number of objects. This is called land capacity, but older Residents may also use the outdated term "prim limit". The number of objects a parcel supports is directly related to its size; larger parcels have a greater capacity to support more objects. Under certain conditions, it is possible to increase the number of supported objects on a parcel. If you own more than one parcel in a region, the land capacity of those parcels is a unified pool. For instance, if you own one parcel with a capacity of 117 and another parcel in the same region with a capacity of 33, you have a total capacity of 150 on your land in that region. You can distribute your objects across your parcels however you see fit. Note: You cannot share land capacity between parcels in different regions. 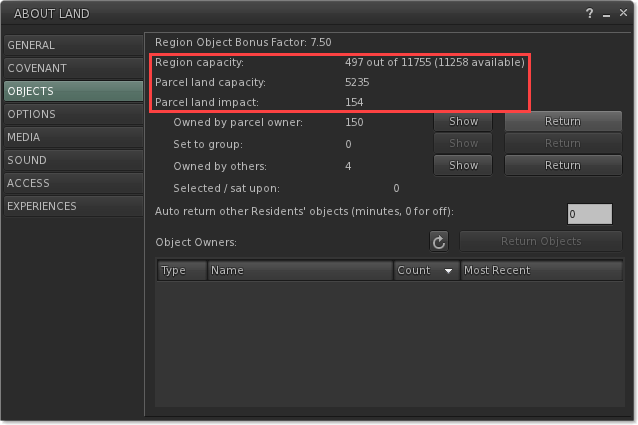 An object bonus is a multiplier for land capacity on any given parcel and may have a value between 1.0 (the default) and 10.0. Set at 1.0, each 512m2 parcel has a land capacity of 117. Set at 2.0, each 512m2parcel has a capacity of 234, and so on. The maximum land capacity per region is 15,000, regardless of the object bonus. Select World > Place Profile > Region/Estate. Make sure you are on the Region tab of the Region/Estate window. Set an Object Bonus multiplier and click Apply. Example: One regular region has a capacity of 15,000. If you divide it into two equal parcels, each parcel has a capacity of 7,500. If you set the object bonus to 2.0, each parcel shows that it has a capacity of 15,000. The region cannot actually support 30,000 land impact from objects! In order for one of the parcels to hold 15,000, the other parcel must be completely empty. The "bonus" for one parcel equals the land impact not being used on the other parcel. Important: The object bonus setting does not increase the total land impact the region supports; if the total land impact in the region exceeds 15,000, no new objects will be allowed to rez, regardless of a local parcel's limits. Warning: Once set, lowering the object bonus may cause objects to be returned or deleted. This gives you, as a landowner, the ability to block other Residents' objects from coming onto your parcel. You can also stop other Residents from building on your land by unchecking Everyone next to Build in the OPTIONS tab of the ABOUT LAND window. This prevents objects from being rezzed on a parcel. If someone leaves something on your land that doesn't belong there, you can return it using one of the options below. You can return any object on your land to the object's owner. Simply right-click the object and select Manage >Return. The ABOUT LAND window lets you pick whole groups of objects to remove at once. Owned by parcel owner: Objects owned by the landowner or deeded to the group. Set to group: Objects owned by group members that have been set to the group. Owned by others: Objects owned by people who are not in the group as well as objects owned by group members but not set to the group. To remove all objects belonging to one of these categories, simply click the Return button next to the appropriate type of object. If a parcel is filled past capacity, it automatically returns objects. It starts with objects in the Owned by others category, then returns objects that are Set to group, and finally returns objects Owned by parcel owner if needed. Auto return proceeds from the newest to oldest objects in each category. You can also set auto return to automatically return any objects in the Owned by others group after a given number of minutes. You can find the auto return setting in the Objects tab of the ABOUT LAND window; it's the field labeled Auto return other Residents' objects (minutes, 0 for off). As the name implies, you should set this field to 0 to turn it off. Objects categorized as Owned by others (from newest to oldest) are auto returned before any objects belonging to the group. This helps prevent malicious users from trying to attack your build by bringing in their own objects. When you enter a number for auto return, it is set instantly and retroactively, so entering 15 (for example) immediately causes any objects left for more than 15 minutes and marked as Owned by others to return to their owners. Objects from a neighbor's land overlap or overhang onto your land. Someone leaves objects on your land. Governor Linden has land nearby that is filled with litter. If your parcel is being encroached upon by overhanging objects, contact your neighbor—who probably doesn't realize that your property line has been crossed—and ask that the overhanging objects be moved or removed. Right-click it and select Manage > Return. Contact the object owner about removing it. You can also return objects by selecting World > About Land and clicking the OBJECTS tab. Click the Refresh icon, select the Resident's name, and click Return Objects. You also have the ability to stop objects from moving onto your land from other parcels by unchecking the Object Entry checkbox for Everyone in the ABOUT LAND window's OPTIONS tab. 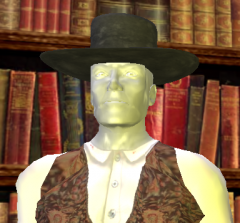 If you discover Governor Linden-owned land on which auto return does not appear to be set, please submit a support ticket informing us of the situation. If none of the solutions above work, send an abuse report by selecting Help > Report Abuse. As always, please provide us with as many relevant details as possible. You can exercise your rights as a Second Life landowner by restricting access to your property. You can restrict access to parcels and estates you own or manage based on whether users are over 18 years old and whether they have payment information on file with Linden Lab. Important: If your land contains adult content, as defined by the Second Life Maturity Ratings, it is your responsibility to restrict access only to those who are at least 18 years old. Choose World > About Land. Alternatively, right-click the ground and choose About Land. In the ABOUT LAND window, click the ACCESS tab. Make sure Allow Public Access is checked. To restrict access to those who are at least 18 years old, check Must be 18+. To restrict access to those who have registered a payment method (such as a credit card or PayPal) with Linden Lab, check Must have payment info on file. Right-click your parcel of land and choose About Land. Alternatively, click Add under the Always allowed field. The CHOOSE RESIDENT window appears. Using the three tabs in the CHOOSE RESIDENT window, you may Search for specific Residents, add Friends (from your list) or add nearby Residents (using the Near Me tab). For each Resident you wish to add, highlight the Resident's name and click Select. Ability to hide avatars on a parcel from those outside the parcel and vice-versa. This feature enables you to hide avatars and their activities and conversations from those outside a parcel and vice-versa. Ability to restrict sounds emitted by avatars on the parcel. To set these features for a parcel, you must use Second Life Viewer 2.8 or later, or a compatible third party viewer. However, if a parcel has hidden avatars or has restricted avatar sounds, you are affected regardless of which Viewer you are using. Meetings and classrooms - when you want to meet with people without being observed or overheard by others on the region. Home dressing rooms - you can experiment with clothing, skins or avatars outside your neighbors' view. Store dressing rooms - retail establishments can provide areas in which customers can try outfits, skins and avatars without exposure to other shoppers. Warning: Adult activities are not allowed on parcels in General regions, regardless of whether the parcel has hidden avatars. On Moderate land, such activity is only permitted privately, behind closed doors. For more information, see Maturity ratings. Restricting sounds on a parcel may prevent them from disrupting an immersive experience or being used for griefing. Enabling this feature is analogous to muting all cell phones in a theater. It may be used to minimize unwanted distractions in performance settings. The owner of a parcel (or, for group-owned land, a group member with the necessary rights) can hide avatars and their chat from those outside the parcel. By default, parcels DO NOT have hidden avatars. Those outside the parcel can't see nearby text chat from those on the parcel, and vice-versa. Group text chat is not affected. To be clear, when a parcel has avatars hidden, anyone outside the parcel cannot see (or communicate with) those on the parcel; conversely, if you are on the parcel, you can't see (or communicate with) anyone outside of it. The communication restrictions apply only to nearby (regular) chat, not group chat. The world map and mini-map are unaffected. LSL sensors function normally, and detect the presence of avatars on parcels with this setting enabled. Choose World > About Land or right-click on the parcel and choose About Land. De-select the Avatars on other parcels can see and chat with avatars on this parcel checkbox. By default, this checkbox is selected. An icon in the navigation bar shows the status of this setting for the current parcel: The icon appears when you are on a parcel with hidden avatars, and will not be displayed otherwise. The Places Profile window displays the same icon. Pass the PARCEL_DETAILS_SEE_AVATARS parameter to llGetParcelDetails(), and it will now return an integer flag indicating if the avatars are hidden for the parcel. To restrict gesture and object sounds to this parcel, select Restrict gesture and object sounds to this parcel. To restrict nearby voice chat to this parcel, select Restrict Voice to this parcel. You can set a parcel to allow sounds to be played by everyone (the default), only by group members, or by no one. Note: This feature actually "mutes" sounds (prevents them from playing), in contrast to the procedure described above in Restricting sounds to a parcel, which merely restricts them to the parcel. ChooseWorld > About Land or right-click on the parcel and choose About Land. Click the SOUND tab. By default, avatar sounds are not restricted, and the Everyone checkbox is selected. No one: Clear both the Everyone and Group checkboxes. Group members only: Clear the Everyone checkbox, leaving Group selected. Freezing, banning and ejecting are tools landholders may use to deal with troublemakers on their property. To freeze, eject, or ban someone, you must either own the land or be a member of the group that owns the land and be authorized to Eject and freeze Residents on parcels and Manage parcel Ban lists. Right-click on the avatar and select Freeze. You may also release a frozen avatar with Unfreeze from this list. A frozen avatar cannot move, interact with objects, or chat but can still send and receive IMs. Right-click on the avatar and select Eject. You may also choose to save time with Eject & Ban, which does both at once.The avatar is ejected from your land onto an adjacent parcel. Click Add under the Always banned field. Type in the name of the Resident you wish to ban and click Go. Click on the Resident's name and click Select. You may enter additional names or click Close. 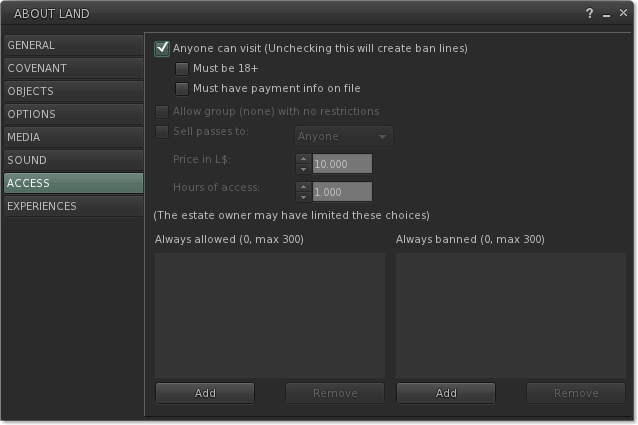 Tip: If you find ban lines unsightly, you can hide them by disabling World > Show > Ban Lines. Provide adequate warning to the undesired Resident. Only work within the property lines (this includes projectiles that cannot operate beyond the parcel boundaries). Not be excessive in the removal of the unwanted Resident. 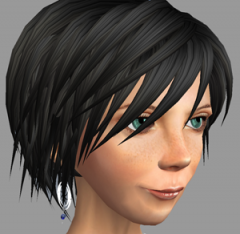 Pushing an avatar off the property or teleporting them home is generally acceptable; intentionally applying a script to disrupt someone's Second Life connection or online status is not allowed. Scripts or no scripts, you cannot use land ownership as a way to unfairly restrict another Second Life Resident's personal freedoms. To allow combat on your land, open the ABOUT LAND window (World > About Land), click on the OPTIONS tab, and de-select Safe (no damage). Tip: If you do not see the combat indicators, right-click on your navigation bar and select Show parcel properties. If you do not want to allow other Residents to enter your land by teleporting, you have several options for diverting or blocking such attempts. Choose the Allow only residents and groups listed below radio button. If you disallow public access, only the Residents on your Always allowed and Groups always allowed lists are allowed to teleport to your estate. Stand on your parcel and choose World > About Land. Click the OPTIONS tab on the ABOUT LAND window. Blocked prevents any attempt to teleport to your parcel. Any Resident who tries to teleport onto your land is diverted to the nearest available parcel instead. Landing Point diverts any incoming Resident to a specified landing point on your parcel. Stand on the location on your parcel where you want to make a landing point and choose World > About Land. 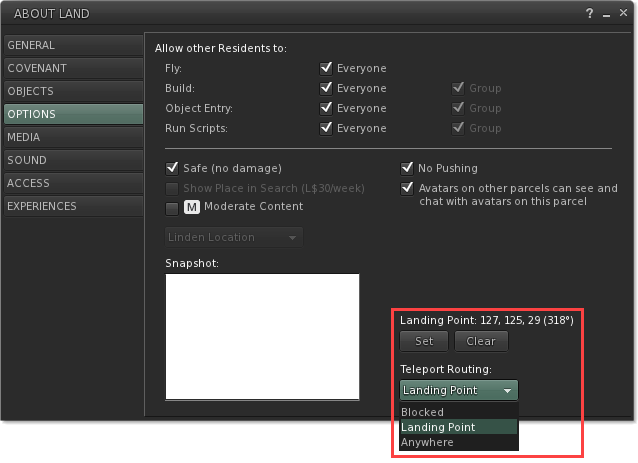 Select Landing Point from the dropdown menu under Teleport Routing. Note: If you are the owner of a Region, you always teleport to the center of that Region rather than to a telehub or landing point. If there is a rolling restart going on, the region your land is in may be temporarily offline. Check the status blog. The region you're trying to enter may be full. Take a look at the region on the World Map to see how many green dots are on it. 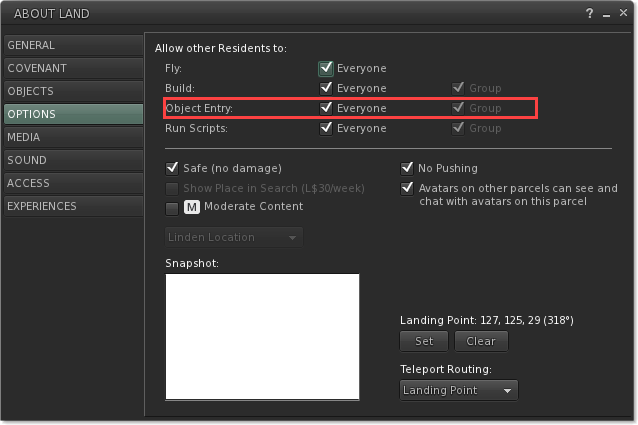 Check the ABOUT LAND window's OPTIONS tab to see if Teleport Routing has been set to Blocked. If so, you might be able to get around this by teleporting into a neighboring parcel and walking or flying in. Your account may be delinquent. Check by viewing your Account Summary in your Dashboard (shown by clicking Account on the left). It is possible that the estate owner has changed the access permissions or that the region has been taken offline due to issues with the owner's account. Contact the estate owner to find out what's going on. In the ACCESS tab of the ABOUT LAND window, make sure either Anyone can visit or Allow group [group name] with no restrictions are enabled, or that individual names are added to the Always allowed list. If you choose to limit access to a certain group, make sure your friends are in the group! If you want your friends to be able to teleport onto your land, make sure that Teleport Routing is enabled in the OPTIONS tab of the ABOUT LAND window. If your land is in a Private Region, verify that the region either has a Telehub set up or has Allow Direct Teleport enabled in the Estate tab of the Region/Estate window. Residents who cannot enter your land should check their maturity settings in the Preferences window. For more information, see Maturity ratings. Landowners can select and display a variety of online media content including web pages, movies, images, text documents and audio. Currently, the displayed media is entirely non-interactive, meaning you cannot click web links, use scroll bars, or press buttons on web pages displayed on parcels. The MEDIA tab of the About Land window contains many options for displaying media on your land in Second Life. To access the About Land window for a parcel of land, right-click the ground and select About Land. You must own the parcel, or have sufficient group abilities on a group-owned parcel to modify the land's media settings. Type - This dropdown menu allows you to override the media you would like to play on your land. Use this option if the media type is set incorrectly or set to No Content. The text to the right of this dropdown box displays the media's MIME type. Home Page - Address of the media you would like to show on your parcel. 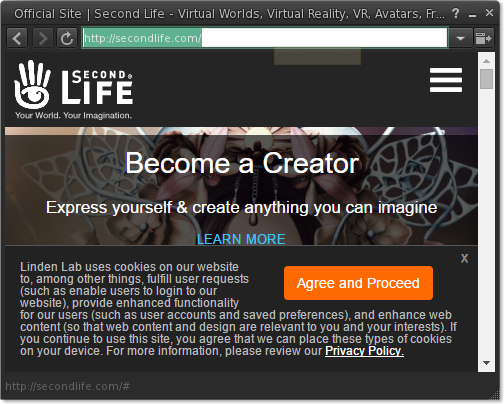 For example,http://secondlife.com is the URL for Second Life's Knowledge Base. Set the Media URL by pressing the Set button and entering the new URL into the SET MEDIA URL window. Description: Enter a description of your Media URL. Replace Texture - Objects using this texture show your movie or web page after you click the play arrow. To change the texture, click the box containing it. Size - Allows you to define the size of the displayed media, in pixels. This option is not available for video media. Sound: Restrict gesture and object sounds to this parcel - Enabling this means an avatar needs to be on this parcel to hear gesture and object sounds originating from within it. This is useful if you have environmental ambience like birdsong and don't want to disturb the neighbors, or if you have an Adult-rated establishment and prefer that passerby don't hear sexually explicit noises. As cautioned above, maturity ratings take precedence. Enable Voice - This is turned on by default and means people on this parcel can use voice chat to communicate. However, if voice is disabled at the estate level (in World > Region/Estate then clickEstate tab), this and Restrict Voice to this parcel will be grayed out. Restrict Voice to this parcel - Similar to Restrict gesture and object sounds to this parcel, enabling this prevents voice chat from being heard by avatars unless they are on this parcel. Good if you want to have a spatial voice chat in the open yet maintain some privacy. Play: When the object is clicked, it acts as a play/pause button for the parcel's media stream. The same effect can be achieved by pressing the Play button in the lower-right corner of your Viewer. Open: When the object is clicked, your browser of choice (the Viewer's media browser or an external web browser, depending on your Preferences; see below) attempts to open the parcel media URL. Note: This option will not work on a movie media type, which alwaysfunctions as Play parcel media if the media is not already playing on your Second Life viewer. Use my browser (IE, Firefox, Safari): If you select this option, all web hyperlinks in Second Life open in your computer's default web browser (Firefox, Safari, Internet Explorer). Use built-in browser: If you select this option, web hyperlinks in Second Life open inside Second Life's media browser. Use this option to view web content without switching away from the Second Life Viewer. Enable plugins: Check to enable the built-in web browser to run plugins such as Flash. Accept coolies: Cookies are bits of info stored by websties, used for a number of purposes, including personalizing content. If you have privacy concerns, reject cookies by unchecking this option. The Sound & Media tab includes a checkbox to Allow media to auto-play. If you check this box, media automatically plays when you enter a parcel with a media URL and media texture set. Otherwise, you have to play media manually. Open in My Web Browser: Pressing this button opens the current media browser URL in your computer's default web browser (Firefox, Internet Explorer, Safari). You may wish to use this option if web content is not displaying properly inside Second Life. See the edit of the OP in this question of the Answers forum: http://community.secondlife.com/t5/Land/Joining-non-contiguous-land/qaq-p/1401075 Perhaps it&apos;s a good idea clarify that parcels must share a common boundary for join that parcels. Thanks again for the input, Irene! I added that requirement, and split out the prerequisites to join two parcels. Home Page - Address of the media you would like to show on your parcel. For example,http://secondlife.com is the URL for Second Life&apos;s Knowledge Base. Set the Media URL by pressing the Set button and entering the new URL into the SET MEDIA URL window. http://secondlife.com (which is also the example given in the accompanying graphic) is NOT the URL for Second Life&apos;s Knowledge Base (http://community.secondlife.com/t5/English/tkb-p/English_KB), it is the URL for the Dashboard (when logged in; redirects to secure page https://secondlife.com/... ). In addition, the link points to neither the Knowledge Base nor the Dashboard. Instead, it points to the Wiki (http://wiki.secondlife.com/).